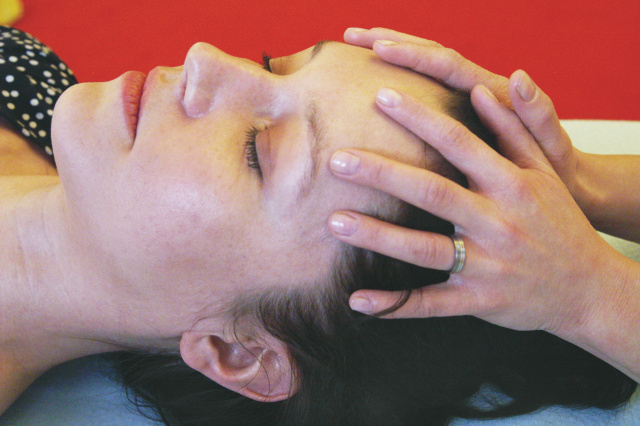 CranioSacral Therapy (CST) is a light-touch technique practiced by thousands of therapists worldwide to relieve numerous health issues. The author, a CST practitioner, educator, and wife of CST developer John Upledger, D.O., will describe the origins and development of CST, and how this technique can be incorporated into your practice. The body’s craniosacral system comprises the membranes and cerebrospinal fluid that surround and protect the brain and spinal cord. It extends from the cranium (skull, face and mouth) down to the sacrum (tailbone area). Any restrictions in the membranes of this vital system can directly affect all aspects of central nervous system performance. As CST practitioners, we palpate the craniosacral rhythm, which leads us to restrictions in the body. We then work with the body’s innate healing mechanisms, using the craniosacral rhythm and system as our guide, to correct the restrictions. While CST as it is practiced today has existed since the early 1980s, its roots actually date back to the early 1900s and the theories of osteopathic physician William Sutherland. For more than 20 years he explored the concept that the bones of the skull were designed to allow for movement. He eventually developed his theories into a structural therapeutic method known as cranial osteopathy. In 1975 osteopathic physician John E. Upledger picked up the gauntlet and embarked on a scientific journey to confirm Sutherland’s theories as well as refine our understanding of the processes behind them; i.e., the craniosacral system. For the next seven years he led a team of anatomists, physiologists, biophysicists and bioengineers at Michigan State University in research and testing of the craniosacral system that included ways to address it therapeutically - what John Upledger later termed CST. Through this process, Upledger’s team took a different approach than the osteopaths who came before them. Instead of focusing on the bones of the cranium, they were tapping into the fluids and membranes of the system, as well as the mechanism that moves the cerebrospinal fluid within the skull and spinal canal. This is one of the majorfactors that distinguishes CST from cranial osteopathy. Research showed that cerebrospinal fluid circulates through the brain and spinal cord via the expanding and contracting motions of the semi-closed hydraulic craniosacral system. This movement occurs at a normal rate of 6 to 12 cycles per minute—what we call the craniosacral rhythm. When there is contracture in the soft tissues, or meninges, in the skull and spinal cord, the cyclical fluid dynamics of the craniosacral system cannot flow unrestricted. The cranial bones are also held in their lesion patterns because of the anatomical connection of the dura to the skull bones. CST practitioners are taught how to palpate the subtle craniosacral rhythm to detect areas of restriction in the membranes - particularly focusing on the dural membrane or outer meningeal membrane layer. Once we are drawn to a particular obstruction, we hold the position and wait for the tissues to release. This involves the use of very gentle hand pressure - generally in the area of 5 grams, or the weight of a nickel. (This light touch is another distinguishing factor of CST versus other cranial techniques.) Oftentimes just the process of gauging the system for imbalances allows the system to self-correct. CST consists of a series of techniques that comprise its foundation. Each step is designed to be used as both an evaluative and corrective tool. While it is not essential to follow the exact order of the 10-step protocol, it is essential to follow the exact procedure and application of each step. Advanced CST practitioners often alter the sequence depending on what the client’s body is telling them. For those just starting out, though, it is recommended that the protocol be followed in its prescribed sequence. This will help you obtain the most benefit from the process as well as continue to hone your palpation skills. Using the protocol to evaluate the functioning of the craniosacral system can produce unexpected insights into the true source of a client’s complaint. This philosophy is reflected throughout the CST curriculum. From the outset in CranioSacral Therapy I, the focus is on refining and deepening palpation skills in order to address soft tissues both intra- and extradurally. The beauty of CST is that it works gently to facilitate the free flow and ease of movement of all the body’s fluids, membranes, muscles and fascia. Because of this it can be incorporated at any stage of a massage session to benefit theclient. 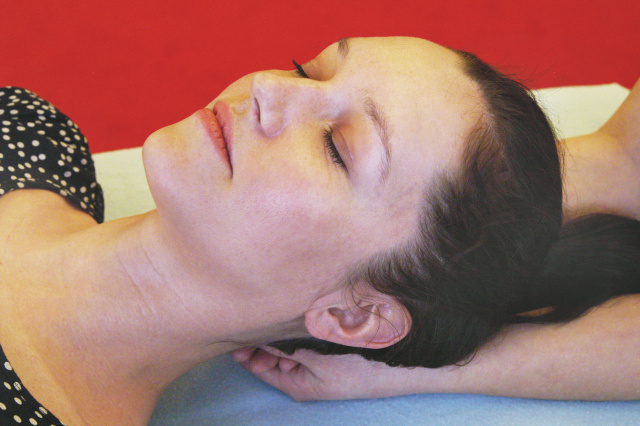 Before the session, CST can help prepare the body to relax and receive the techniques that follow. During the session it can help release areas of restriction that come to light. And afterward, it can balance the body and help it to retain the gains made. No matter the methods used, the bottom line is, the more we are able as therapists and bodyworkers to perceive what the body is telling us and to facilitate its ability to correct itself, the better resource we become for those suffering tension, stress and dysfunction in all its many manifestations. CST is a tool that can help us achieve that goal. For information about The Upledger Institute’s full CranioSacral Therapy curriculum, visit www.upledger.com. 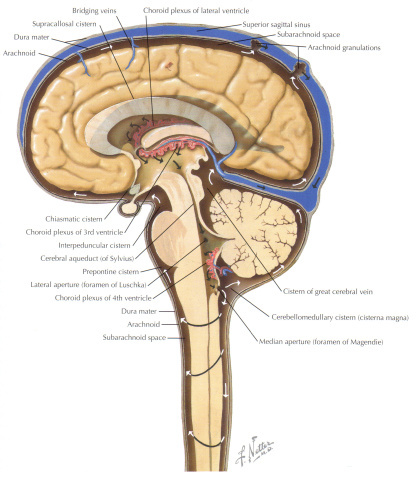 The picture above is used from Netter´s Atlas of Neuroscience.